Classical Numismatic Group, Lancaster, PA, May, 2013. 652 pages with 6800 listings of numismatic bibliography, large format, laminated boards. New shrinkwrapped copy. Issued in very limited edition of only 250 copies that is expected to sell very quickly. 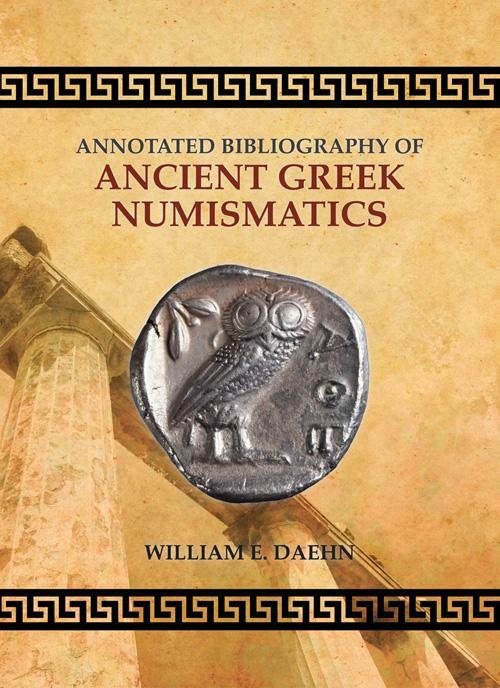 In 2001, William E. Daehn published Ancient Greek Numismatics – A Guide to Reading and Research. A Bibliography of Works Written in English with Summaries of Their Contents. This book has remained an important research tool for the numismatist of Ancient Greek numismatics, since the author included content summaries with each bibliographic reference. Its major drawback, however, has been that the book was limited to citing only English language works, at the exclusion of the rich literature on the subject in non-English. Recognizing the need to include non-English language works into the bibliography, he has been doing so since 2001. The result is the Annotated Bibliography of Ancient Greek Numismatics. The arrangement of this book is fairly straightforward. Beginning with general references, it then proceeds to works on special aspects of Greek numismatics, and then specific geographic areas. This latter section follows the arrangement traditionally used by catalogers of Greek coinage, moving clockwise around the Mediterranean. Each section or subsection is alphabetical by author, and chronological when an individual author has written two or more works on the same subject. Critical reviews are noted where necessary, and reprints of the same article, as well as the publication country of foreign journals, are noted where applicable. Like Clain-Stefanelli, each entry has been assigned an index number, and a concordance to Clain-Stefanelli is also included. Indexes specifically of authors, reviewers, and collectors and collections, as well as indexes of cities, districts, kingdoms, and tribes, are located at the end of the book. The most important feature of this book (as well as that of the previous one) is the inclusion of a brief synopsis of the entry’s contents and main conclusions, which allows the researcher and the collector to efficiently conduct their research and supplementary reading. Many of the entries are by the author; those from elsewhere are referenced to their appropriate source. This book will be a useful inclusion into the library of any numismatist or serious collector of Ancient Greek coinage.